The company is located in Phoenix, Arizona, USA, and offers their customers a wide variety of oils. They are comparatively new to the essential oils industry and are not an MLM (Multi-Level Marketing) company saving you money that would be paid out to the members. Their mission is for customers to have the small boutique experience with high quality therapeutic 100% essential oils. To achieve this objective, they work with global suppliers for the superb oils supplied at an affordable price to everyone. They give excellent customer service and products can be returned within 7 days of purchase if you are dissatisfied and they offer a lifetime refund guarantee on all of their products! Healing Solutions® is transparent when it comes to each bottle of true pure essential oils with the recent addition of their in-house laboratory. They have started a program publishing their GS/MC (Gas Chromatography Mass Spectrometry) testing results at their website, and this will be finalized later. The oils are GC/MS (Gas Chromatography Mass Spectrometry) tested to analyze individual molecules of each plant’s oils for customers to have the best quality essential oils on the market. Go to any of their essential oil pages and if the GC/MS result for it has been posted to the website there will be a link to it. They are additionally working on lot numbering and to create the ability on their website to input the lot number from any bottle of oil that you have to see the GC/MS testing results for the specific batch of oil in that lot. Tested by the laboratory, the single oils offer healing properties and aromatherapy fragrance to the space you are in. The oils are pure, potent, and of high-quality. Rare and popular oils are available from Healing Solutions®. The Peppermint (Mentha x piperita) essential oil is GC/MS laboratory tested and confirmed to be pure. Your Peppermint is packed in an amber sun resistant glass bottle in a 10 mL size. The European dropper cap at the top has a hole for easier dispensing. Always store your oils in a cool dark place out of sunlight. Peppermint is good for short-term IBS (irritable bowel syndrome) treatment, it is cooling on the skin used topically in a massage blended with a carrier oil to relieve itching, muscle, and nerve pain. It has a pleasant fragrance used in aromatherapy. It enhances memory and mental alertness. Add 2 to 5 drops to your ultrasonic diffuser and enjoy its benefits. The many blends come in 10 mL bottles with dispenser dropper in the top under the threaded lid also in amber glass bottles. If you are new to essential oils and don’t have time to blend varieties together yourself, Healing Solutions® is the way to start for the ideal blend from anti-aging, pain solutions, immune system defense and more with the well-liked blends of Aphrodisiac Blend, Balance Blend, Breathe Blend, Head Ease Blend, Health Shield Blend and the Joy Blend. The blends are reasonably priced and are 100% therapeutic grade. Boxed sets are available in Single Oils, Blends, Beginners, Family Doctor, Blends with Singles in a variety of fragrances. Save money with a subscription for all essential oils from Healing Solutions® when you enroll in the Oil of the Month Club. You can select any blend, single oil, or set at regular times that you choose. When you sign up for this special service you will save 10% or even more from the individual price. Another great value is when you join the Oil of the Month Club you will receive a different product each month that will surprise you being something new that you’ve never tried before in single oils and blend. As always, the bottles in the various sets are 10 mL with the dropper under the lid. 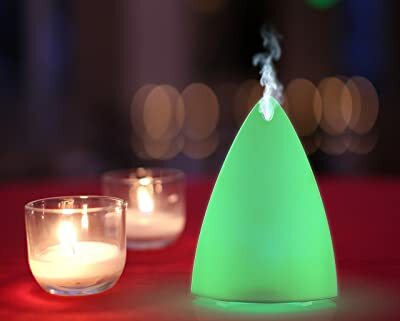 Healing Solutions® has a lovely ultrasonic cool-mist diffuser using their oils (not included) with its 7 different colored long-lasting LED lights. The water reservoir holds 100 mL (3.38-ounces) of water adding 2 to 5 drops of your favorite essential oil or blends. When you pair it with a remote control you can operate it from anywhere in the room. The diffuser is very quiet covering 200-square feet of space to remove tobacco smoke, pet odors, and last night’s fishy dinner stale smell. It will shut off automatically when the water is low. The moisture and oils you select will help with colds and flu symptoms for kids and adults alike. Dry mucosa membranes in the nose and dry chapped lips will be helped as well. A Lifetime Replacement Warranty is included. I hope my endorsement for Healing Solutions® has been helpful for you. Know that if you are not completely satisfied for any reason, contact them for a refund or exchange with their excellent customer focused team. They want you to be 100% satisfied with your purchase. Reveal the secrets of Mother Nature’s plant kingdom for a new healthy standard of living. The ancient cultures understood plants and their benefits as did the new pioneers with the Native Americans who truly understood and respected all plant life. Be well and be happy always!